Appalachia & Beyond: Be a Summit Sampler, Get $500!!! "In celebration of the 60th anniversary of Sir Edmund Hillary's ascent up Mt. Everest, Post® Grape-Nuts® is recruiting modern-day adventurers of all ages and abilities to ascend a nearby peak of their choice and distribute samples of the new Grape-Nuts® Fit cereal to any and all they meet along the way (whether it be one hiker or several dozen). And don't worry...the selected local mountain need not be Everest-like in height or fame! Up to 60 participants will be selected to participate as "Summit Samplers" and climb their chosen mountain on or around May 29, 2013. 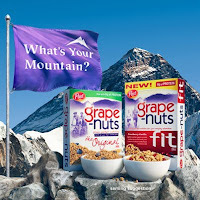 Those selected to participate will receive a Summit Sampling kit, complete with Grape-Nuts® Fit cereal samples, a backpack, a t-shirt, a water bottle, a carabiner, and "summit flags". Selected participants who complete their journey and submit photos of their adventure will also receive a $500 check. To submit an application and read the official rules, visit www.GrapeNutsSummitSampler.com before April 19, 2013. No purchase necessary to submit an application." Good luck to all who enter, I know we will be.